Joni Ikonen loves scoring goals. Lucky for him, he’s pretty good at doing it too. Ever since he moved to Sweden to play for Frölunda’s junior team at the age of 16, he’s been, remarkably enough, lining up more goals than assists – and his overall point production has gone through the roof. After two seasons in the U18 and U20 divisions, Ikonen has an average of well over one point per game. It’s easy to see there’s a lot of talent and an even bigger load of potential here. Although, it would be a shame to reduce Ikonen to merely a player suited for offensive production. His contributions on the ice stretch far beyond that. The Finnish center, who also feel comfortable on the right wing, is a player worth watching even when he doesn’t score. Yes, he’s quite small. But for that he compensates with admirable work ethics, dazzling skill, and effortless speed. Ikonen demands the puck like few others, constantly wanting to prove himself and make a difference. If anything, that shows leadership qualities. It’s no secret that Ikonen still needs to grow bigger, but hey, the kid’s 18 years old. Time will do him right. In the 2016-17 season, he played 10 games in the Swedish Hockey League, and while he didn’t notch any points, he still showed that he belongs in the big league. It wouldn’t be surprising to see him make a true impact next season in the SHL. After all, in my book, we’re talking about a potential star player here, and the general manager that picks Ikonen in the NHL Entry Draft this summer should consider himself clever. 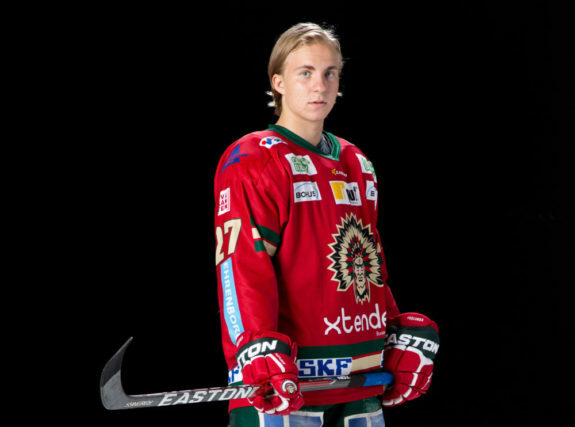 Ikonen should be a name for the late second round of the draft. Due to a size bias that still exists in the NHL, however, it’s not unlikely that he ends up going in the third round. With Ikonen’s offensive production level in mind, he can definitely be suited in the NHL for a role on a top six line in the future. It’s not for nothing that the confident young Finn can be compared to skilled NHLers such as David Pastrnak and Viktor Arvidsson. Ikonen knows how to be a clutch player. In the 2016-17 season, he helped Frölunda HC’s junior team winning the U18 Swedish Championships. Ikonen lined up twelve points in seven games during that playoffs. And in the U18 World Junior Championships this past season, he was one of Team Finland’s most outstanding figures – rightfully voted as one of the top three players on the team – when Finland claimed the silver medal.